Founded in 1993 As a joint venture company between Thai and Japanese who have the vision to contribute societies with tasty and quality food. 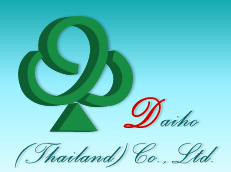 Daiho (Thailand) Co., as a food manufacturer, contributes to the society of all countries, providing more dellicious foods through originally developed technology of food science by the company. Fresh Frozen & Marinated products. Focusing on high quality, Daiho’s quality control covers each step of production process making it possible to meet quality certification standards such as the United States food and Drug Administration (FDA), Europe Union and HACCP. Daiho recognizes that it is part of the local community. As such, the company is ready and willing to give back to society by supporting various government and local municipal projects. There include donation of funds as well as the provision of information on business guidelines and the export situation. Fully aware of the importance of environmental preservation, Daiho sets up its factory in the industrial estate where the environmental rules are strict. The wastewater treatment system of the industrial estate is of higher standard than required by law.